I was surprised to get an email a couple days ago saying that my site had been part of an article in this month’s .Net Magazine (Practical Web Design here in the States). Unfortunately, the issues are delayed about a month here so Elliot was kind enough to take a quick picture with his iPhone. It’s a bit blurry, but does the job. Damn the delay! Neat! You’ll have to bring it into the office when you get a copy. Hi-res photos to follow, dude… I promise! Congrats Kyle, I don’t know anyone who is as focused and hard working when it comes to web design as you ^_^ But then I really don’t know that many, haha. Congrats, Kyle! Make sure you buy several copies for yourself (and your mom, ‘natch). Everyone: Thanks for the kind words. Congratulations Kyle! The blurry picture is nice but it’ll be really cool to see in person. Congrats man, haven’t talked to you in a long time, I picked up those books you suggested though, “Bulletproof Web Design” and “Transcending CSS” thanks for the recommendations. 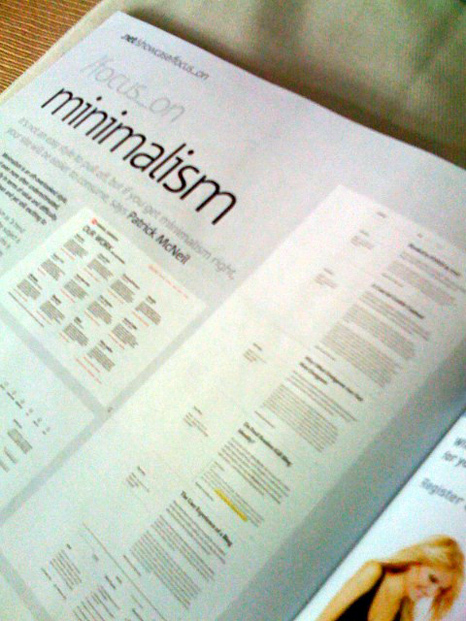 I found this site through that article in .Net magazine, and as a huge advocate of minimalism, I must say Astheria definitely does it right. Excellent job, Kyle! Hey, that’s awesome to hear. Congrats Kyle. Love the site, and congratulations on this article! Is this in issue 172? I’d like to grab a back copy, but I don’t want to order the wrong issue. @Jeremy: Yes, it’s in #172. Here’s a link to the specific issue page. I’ve had a subscription to .NET for over 3 years now and it’s the one magazine I feel compelled to read in order to stay on top of everything. Anytime you get a write-up or mention in this magazine - it’s a very good thing even though the mag is UK based so well done. So..job well done. Furthermore, we are going through a redesign and minimalism is certainly going to be a focus.